I am rather fond of frogs. 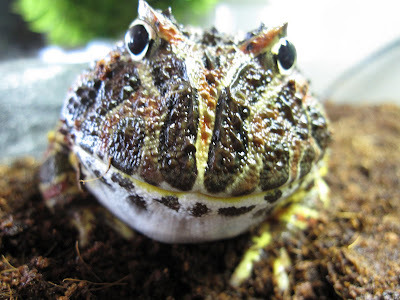 I even share my home with one rather splendid Ornate Horned Frog called Winston. and it provided us with the perfect excuse to sneak an extra couple of days of field work to go out and collect the remaining species so that we could display all thirteen species that are native to the Chicago region. Well now Save the Frog Day has become a permanent fixture on our calendar and each year we try and change things up a bit. This year we decided that as well as displaying all the native frogs we would also show some exotic species too. In my totally unbiased opinion Winston stole the show! As well as having over 25 species of frogs on display, we had an information table for visitors to find out about all the threats that amphibians are facing and what they can do to help. We had representatives from the Frog Monitoring Network recruiting volunteers to partake in their citizen science program. Hopefully we got our message out that many amphibians are facing a lot of threats in the modern world and they are an enigmatic and delightful group of species that are well worth protecting and conserving.